Nancy Karrels is one of this year’s participants to the German-American Exchange program on provenance research (PREP). At the public event in Berlin on 27 September 2017, she will be talking about her exhibition on provenance research methodology at Krannert Art Museum. In an interview, she gave us a small insight into her work. Nancy, you work at Krannert Art Museum in Illinois. Before we turn to your work as a provenance researcher, could tell me something about the museum? Nancy Karrels: Krannert Art Museum was founded around the mid-twentieth century. It is the art museum of the University of Illinois’ flagship campus in Urbana-Champaign. It was established around a donation of European art, and today has an encyclopedic collection that is also very strong in African art, contemporary art, and South American art. How did you get to work there as a provenance researcher? Nancy Karrels: I started off my career as a lawyer in Canada before I went into museums. Since law school, I’ve been interested in bringing art and law together, and I thought provenance might be a good way of doing this. Then I completed a Master’s degree in museum studies, and wrote my thesis on current approaches to Nazi-era provenance research in American museums. During that time I interned at a few museums, most notably the Boston Museum of Fine Arts, which has a curator for provenance. When I started a PhD program in art history in 2015, I selected the University of Illinois. One of the reasons I chose Illinois was that they have Krannert Art Museum with its great European art collection. Soon after I arrived, I went to Krannert and told them about my experience in provenance research and asked whether I might help with their provenance research. They already had a gap list for 27 European paintings that were created before 1945 and traded after 1933 that needed to be researched to be in conformity with the Washington Principles. So they were very enthusiastic about bringing me on as a graduate intern, and I’ve spent the past two years researching the WWII-era-provenance of this specific collection. When did you come up with the idea of doing an exhibition on the subject? Was it already in the back of your mind when you started? Nancy Karrels: I think that since I started working in provenance research around 2012, I have had this dream of one day curating an exhibition where I would show the backs of paintings instead of showing their fronts. That wasn’t a very fully developed thought, just an idea. 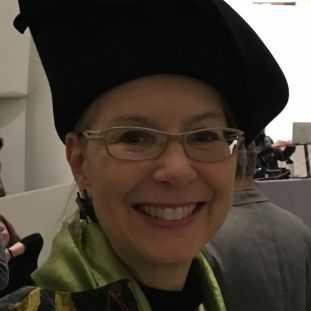 When I started to work at Krannert, my supervisor Maureen Warren – she’s the curator of European and American art, and a fantastic mentor – invited me to give a public talk at the museum. I also spoke about my work on other occasions, and we discovered that there was a fair amount of public interest not just in the results of provenance research, but in the methods and in the problems that I encounter in the course of my research. So the idea for this exhibition developed organically between us in my first year, and then in my second year I started to work it. Was it easy to convince the museum curators that this exhibition should take place? Nancy Karrels: Yes! I still am very much in awe, because at no point in time did anybody at Krannert object to the works I wanted to exhibit, the kind of information I wanted to access, or the information that I hoped to share with the public. Krannert was on board with the importance of the mission of World War II-era provenance research and was on the same page as me. Maureen is a young curator, and so she is very aware of all these provenance issues. But so many people at Krannert were also very enthusiastic and very helpful, and I think it was because they recognized that there was public interest in the subject. Can you describe what can one see in the exhibition? 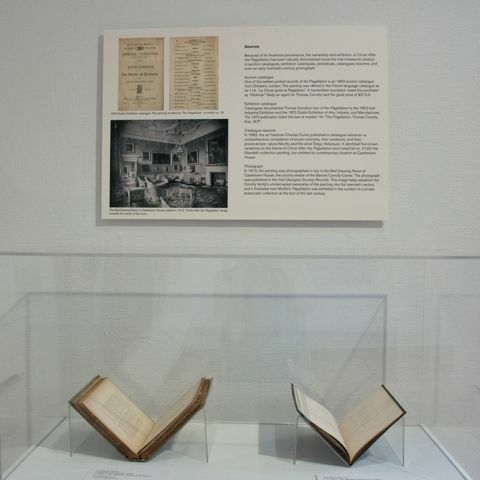 Nancy Karrels: The exhibition demonstrates the practice of provenance research and the problems that we encounter, as well as some methods we employ to deal with those. It’s just one room, and there are seven exhibits in it. Each one addresses a different aspect. When you walk into the exhibition, the first thing you see is the back of a painting. It is an Italian Renaissance portrait, but you don’t know that immediately. It has an Austrian customs stamp at the back, which means it was exported from there. However, the stamp was used before and during the first months of the Anschluss. Even after a long consultation with the current BDM in Austria, we haven’t been able to find the exact record that corresponds with the export of this painting. While there is a greater probability that it was exported before the Anschluss, we’re not 100 percent certain. So this stamp, while answering one question by locating it in Austria in the 1930s, poses a different problem that is ultimately unanswered. We wanted our visitors to understand that not every artwork can have a clear provenance; that sometimes information is missing. Which other aspects did you highlight? Nancy Karrels: Another problem that we addressed is copies. We had a painting that we believed was an original, but when we checked its provenance we realized it was actually a copy! And the provenance of the copy and the original had been mixed up in auction catalogues and catalogues raisonnée over the past 100 years! So when we read the documentation, we had to verify: is it about the original or one of the three copies that we know exist, including ours? Another thing I wanted to highlight is that the objects we do this very systematic, forensic research on all belonged to someone at some point in time. They were cherished by people, were parts of their lives, hung in their homes, were admired by them, sometimes handed down in families before they reached museums, and they meant different things to different people. And while tracing the provenance of an artwork helps us reconstruct this legal paper trail, we shouldn’t ignore the fact that it also weaves together all the lives of different people through whose lives this object passed. 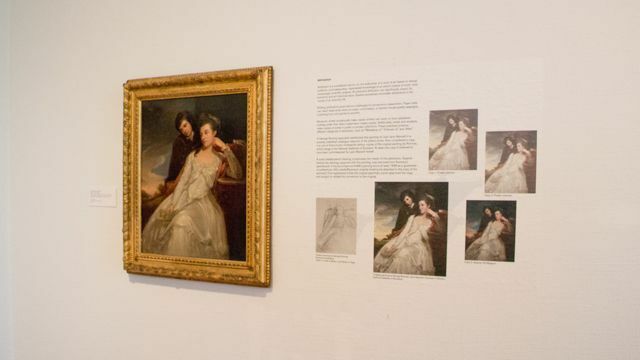 Do you already know of any visitors reactions to the exhibition? Nancy Karrels: Not so much yet (I have been out of town all summer), but the media interest was high. We also got a lot of inquiries from people from far away who won’t be able to come and see it. Are you aware of any other comparable exhibitions? Nancy Karrels: I have never seen or heard of another exhibition that focuses on methodology and practice; I believe that’s maybe something new. Provenance as a subject for exhibitions is extremely rare here. 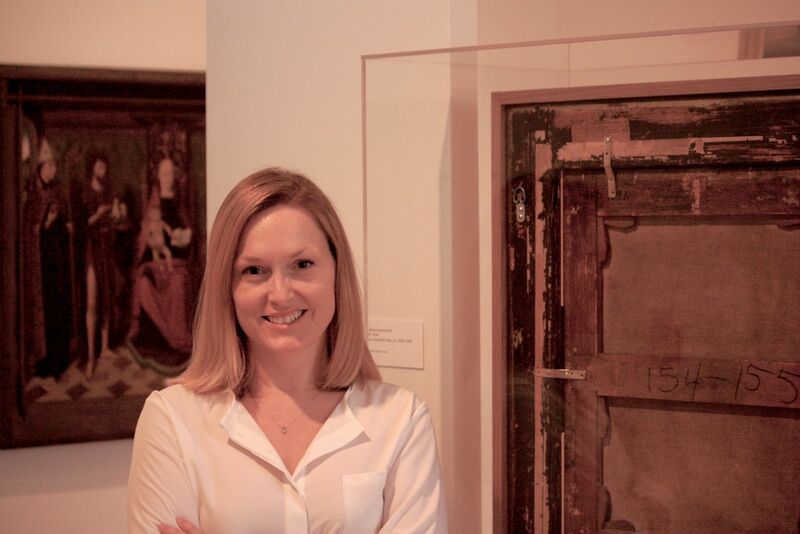 More than 10 years ago Victoria Reed, who is the provenance curator at the Boston Museum of Fine Arts and another terrific mentor, curated an exhibition on her provenance research at the Princeton University Art Museum. And there was a wonderful exhibition at the Getty in about 2013 about the lives of objects that wove provenance into a larger concept about how decorative art objects were used historically. Since Krannert Art Museum also has a collection of non-European art, has it done any provenance research on that? Nancy Karrels: To my knowledge, the curators have conducted ongoing provenance research on the collection. They would like to do more, but there is a shortage of resources. The curator for African Art has invited when I’m done with my project to come and help her with the provenance research for the African collection. They’re certainly very motivated and enthusiastic to get that kind of research done. How does the museum fund provenance research? Nancy Karrels: It would normally either be from university funds, a grant, or from a private donation. In my case, because I have a fellowship that restricts other campus employment, they were able to give me credit as a graduate student. Fragen an… Nancy Karrels, Krannert Art Museum from StiftungPreußischerKulturbesitz on Vimeo. One last question: What did you experience when you met with the PREP people in New York, and what do you hope for when you come to Berlin? Nancy Karrels: I knew almost all the participants on the American side, but I didn’t know any of the German participants. I was amazed and so impressed with their collective wealth of knowledge and also how each person had such deep experience in one particular aspect of provenance. When you have questions, you don’t always know whom to ask. All of a sudden I know this network of people with specialties that I can turn to, and I didn’t have that before. And in terms of coming to Berlin, I am very interested in getting a deeper understanding of the resources that are available – the archival resources, the museum resources, and library resources, and also to become more familiar with provenance research practices in Germany, to see if they are different from what we do in America. 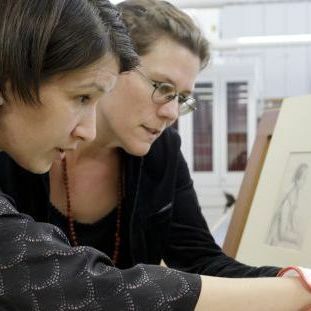 In September, 21 German and American museum professionals will meet in Berlin to learn about issues of provenance research. 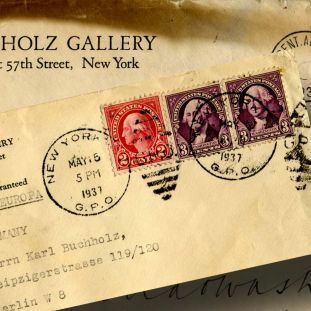 Jane Milosch, Director of the Smithsonian Provenance Research Initiative, explains how the German-American Provenance Research Exchange Program (PREP) came into being and what she expects it to accomplish.